I have a Kole tang that suddenly is covered in a velvety substance. I’m assuming it’s marine velvet… but I also thought it could be marine Ich. Could you confirm which disease it is for me? And I believe this guy is probably to far gone. Friday he seemed fine… today (Sunday) he looks terrible. Unfortunately, this is the best pic I can get. It does appear more velvety than sprinkled with ‘salt or sugar’. I’ve probably just answered my question. But I thank you for your time. It’s a 6 month old system… (75 gallon). 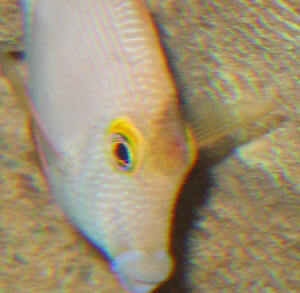 Other fish are 2 ocellaris clowns, 3 Chromis, 1 melanurus wrasse. Also 2 Birdsnest corals and a Montipora, cleaner shrimp… assorted snails. The system was set up immediately in June and was ‘seeded’ with a few pieces of live rock from my old (4 year running) system. for two weeks… (I know, it probably doesn’t work but I was desperate). Was performing 25% water changes twice a week before a new dose of Kick Ich was added. Aside from adding the Kick-Ich, I have added buffer (sodium carbonate) occasionally to combat low Alk. Regular water changes are performed every two weeks and I would have assumed water quality was ok.
All the fish look a little ‘off’ today but the Kole tang looked the worst. All are in hospital tank now… and I was wondering what would be the best course of treatment. OH… and how long should I leave the DT fallow? 8 weeks? I have attached a better pic of the Kole tang in the hospital tank. I wanted to reach out to see if someone may know what's happening to my Tang. I have had this tang for about 5 months now and he has seemed happy, eating, and on occasion would even chase other fish around. About 4 days ago I noticed that the tang suddenly stopped coming out and now his swimming seems wobbly. I have not seen him eat. All the other fish in the tank appear fine. I have not seen him scratching against the rocks/glass, but suspect he may have a parasite (though I don't know where from as there have not been recent additions). He comes to my cleaner shrimp and looks like he wants to get cleaned, but the shrimp does nothing to help and then the Tang scurries away into his hiding spot in the back of the tank. I'm getting concerned because I see that he is not swimming more sluggishly now and not grazing the rocks anymore. I tested the water and found that I had some ammonia (likely from a recent accidental overfeeding). 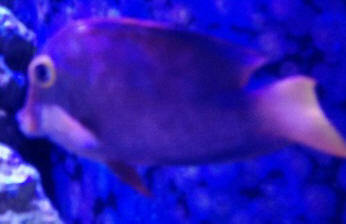 I have since did a water change and stabilized the levels, but the tang still appears unhealthy. Do you have any ideas/suggestions? <I'd try covering one end of this tank (outside) w/ a piece of dark paper. Thank you for your advice. The back of the tank is already covered by a dark paper. He seems to be afraid of me now, I'm not certain why and at least three times a day he swims up to the cleaner shrimp. I took a look and don't see anything on the body but his mouth stays open and it he appears to be breathing more rapidly than normal. I will keep you posted, but if you have any other ideas let me know. Well the Tang is still alive, though nothing I have tried is helping. The Tang's abdomen is very inflamed and he keeps opening/closing his mouth rapidly. Although he is swimming more actively now, he's looking pale and won't come out of hiding often. If you have any other ideas on what I could do let me know. http://img.tapatalk.com/48f49385-6f58-9c96.jpg, though without the skin damage and with a significantly larger inflammation on both sides. Wondering if I should consider freezing at this stage. and started a fan on the water, that brought the temperature down to normal, this was all before the water exchange. Fanning the water has increased the evaporation rate, so he's been adding reverse osmotic water regularly. The temperature has stabilized since then and we've stopped fanning the tank. Over the winter he hasn't been doing water exchanges as regularly as he should, but still at least once a month or so. We feed the tank once a day with Mysis Shrimp, frozen tropical fish food ("Life Line" herbivore and carnivore blocks). The tank also has live rock and a bubbler (which we're going to exchange for a Hydor circulation and wave pump). I've read on protein skimmers, we don't have one, would you recommend it? Hardness 300ppm, Alkalinity 300ppm, PH 8.3, Spg 1.026, with temp 78 F. All the creatures in the tank currently have been together and with his family for years, they were moved about 7 months ago here, and like I said, everything up to this point has been great. The Monday after the water exchange we found the Kole Tang lying on his side on the bottom of the tank, with his tail elevated. He's usually very active, so we were obviously concerned. But when my boyfriend was feeding the fish, he got up and ate with them like usual. He seemed to be lazy in his swimming, sort of swimming along the bottom and too close to the rocks, his fins are getting torn now. He stayed swimming until the light went out then he went to the corner of the tank closest to the water return and kind of wedged himself in between the rocks and the tank wall. We thought maybe he was sick or was attacked by the Clown, so we thought he was hiding for safety. I watched him all day, he stayed right where he wedged himself, not moving much, and not trying to get out of where he was wedged. Again we noticed his face was downward, and his tail was propped up on a rock. You can see the red of the gills through his skin, but he's always looked that way to me, his breathing doesn't seem labored at all, he's not got Ich or Velvet, the other fish are just fine. because it could stress him out too much. Could it be that he's just stressed from all the changes that have happened lately? Or could it be something worse? 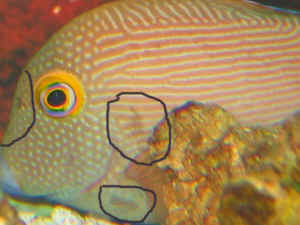 Yellow eye Kole tang issues Mystery Malady or Environmental Response (Tang Condition) 11/18/08 Hi guys, I'm new to your site but been reading on it off and on since I started my reef tank a year ago <Welcome to the site/hobby! 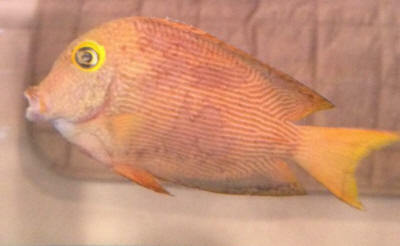 Scott F. in today.> I have a yellow eye Kole tang that over the past few days has begun to look like something is taking chunks out of its head. he had this issue before but it went away so I thought it might just be from him running into the rocks like he does when I dig around in the tank. but these, although they look the same, are just getting worse. he seems to be healthy as far as eating and swimming and being his normal self. just starting to look like he got dropped into a French fry fryer!!! <I can make so many jokes here, but I won't,,,> Its only on his head and no where else. 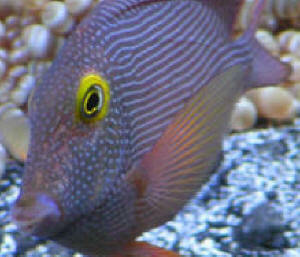 he eats a combination of red sea veggies, green dried sea weed, marine flakes and formula two marine pellets with garlic. and is always grazing on the rock, glass and in the sand. the only thing that seems to of changed is now he wont let the shrimp clean him. <Hmm...> Any ideas on what may be wrong with him? If its a parasite or something will it spread to the other fish in the tank? is house mates include....2 OC clowns, 1 Lawnmower Blenny, 2 Firefish Gobies, 1 Elegant Foxface, 2 Pajama Cardinals, normal Blue Leg and Scarlet hermits, snails, Arrow Crab, Skunk Shrimp, Coral Banded Shrimp and some soft corals. Thanks DJ Hollingsworth <Well, DJ, it's hard to be 100% certain without pics and some information on your system parameters, but I'd hazard a guess that you are talking about "Head and Lateral Line Erosion" (HLLE), which is theorized to be a response to environmental/nutritional deficiencies. Generally, this malady is non-lethal, and comes and goes over time. Tangs and Angelfishes are particularly susceptible. Typically, it can be put into permanent "remission" with very high quality diet (seems like you're just about there...Keep up feeding the marine algae and maybe add some more live rock for the fish to graze on..They are detritivorous and also like to rasp diatoms from rocks/glass) and excellent water quality. Step up your water change regimen and utilize some form of chemical filtration (e.g. ; activated carbon or Poly Filter) to help keep organics to a minimum. With greater attention to these factors, you should see improvement. Hope this gets you looking in the right direction. Do read up on HLLE here on the WWM site! Regards, Scott F.
Kole Tang sick? Bob, Good Morning again, and Happy Holidays. A few weeks ago we had discussed a problem with my 55 gallon saltwater tank being a juvenile Kole tang that died probably due to hypoxia. Since then I have added 2 more powerheads MJ 1200+900) and introduced an adult Kole tang had him for 2 weeks now) and was doing fine until last night or rather this morning. It seems that his skin is peeling off in a small section behind his head, and his skin looks like it has some kind of discoloration. I have also noticed some little white dots on him, but they don't look bumpy at all I thought ick spores(?) look a little bumpy. <Mmm, trouble... but not necessarily parasitic. Have you checked water chemistry? ...> Needless to say, the tang showed no signs of appetite this morning. I am planning to read through your site's material again, but what would that be? Perhaps it is stress induced (I am stating this because 2 nights ago I added a Florida star coral, various Christmas tree worms and a little yellow Atlantic cowry. The tang sleeps next to the newly added coral. I have also dipped the tang twice in fresh water since I got him just to be on the safe side, however I am thinking of placing him in a QT and treating him with some kind of medication but what?) <I would not dip this fish any more... and probably not move it... as whatever the problem is can and should be treated as the whole tank at this juncture. I would place a cleaner shrimp (maybe a Lysmata or Boxer shrimp species)... Do read through WWM starting here: http://www.wetwebmedia.com/tanktroubleshting.htm going on to the articles, FAQs files as they are linked. Bob Fenner> Please help...Thanks, D.